If you’re interested in becoming a cook or simply love making good food, a career as a line cook may be an excellent choice for you. Many fantastic chefs get their start as a line cook, as the career is a great point of entry for the culinary arts. A line cook is usually the person who prepares the majority of the food in a diner or small restaurant. Line cooks often need to work long hours and need to be exceptionally conscientious, as the back of a restaurant can be dangerous. Line cooks need to work in tight quarters and need to be able to keep track of the food they are preparing. They also need to prepare the food in a timely fashion so that it can be directed to the appropriate tables at the same time. Timing is exceptionally important for a line cook, because all of the food needs to come out at a specific time for each table and each course. Line cooks usually work with prep chefs that will prepare certain items for them. Many items that are used often or are used for multiple items, such as chopped vegetables and gravy, will be prepared in advance. The line cook’s job is usually to prepare food to a consistent standard and as quickly as possible. Line cooks are usually not found in higher end restaurants, where the cooking is segregated by duty. A line cook needs to be diligent, versatile and well-trained. According to the Bureau of Labor Statistics, a total of 161,800 new jobs are estimated to be created in the field within the next decade. From the beginning to the end of their shift, a line cook will usually be preparing food. The line cook needs to take orders as they come in and complete these orders. Due to this, line cooks need to juggle many different responsibilities at the same time. Line cooks are usually under the supervision of a head chef or manager. There are many benefits to a line cook position. Many line cooks have the mobility to get hired in another restaurants and they may be able to get promotions within the restaurant. Line cooks have flexible hours and can often set their own hours based around their studies or other responsibilities. A line cook usually does not have any additional responsibilities beyond ensuring that their station is clean and safe. How Do You Become a Line Cook? Line cooks come from all backgrounds, and formal training is not always necessary. Most line cooks will get sufficient on the job training to perform their job. However, line cooks can acquire better positions by advancing in the culinary arts. 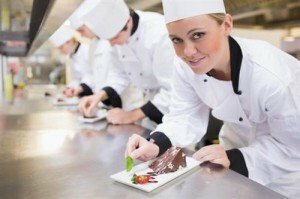 There are many culinary arts schools that are offered accreditation by organizations such as the American Culinary Federation. These schools teach advanced cooking techniques and often have programs for the placement of particularly promising students. Line cooks can also advance purely based on experience, but a culinary arts degree will usually be incredibly helpful in learning the basics. How Do You Advance as a Line Cook? Line cooks have a relatively simple path of career advancement. Line cooks can specialize in specific areas of cooking such as preparation, pastries or sauces. Line cooks can become sous-chefs, assistant chefs, chefs or even head chefs. A line cook may also consider going the administrative route and becoming the manager of a restaurant, though this career path usually requires a degree in business. Those that wish to remain line cooks can increase their income by working for progressively larger restaurants or for restaurants that have better reputations.